By E. Cameron On January 27, 2009 · Leave a Comment | See comments on this post (2)"
US President Barack Obama was already stimulating the economy during his election campaign. The obama mania started just after the day he formally announced his candidacy for president. Obama mania on merchandising products like posters, buttons, t-shirts, mugs, plates etc., but also on some more extreme products, see for example some 18 nutty pieces of Obama merchandise. 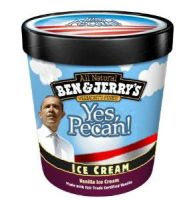 The obama mania also has its effect on the intellectual property market. In the past months during the elections, several US companies filed applications for new trademarks at the United States Patent and Trademark Office (USPTO). A current search on the Trademark Electronic Search System gives a list of 73 pending filings for trademarks incorporating the president’s name. 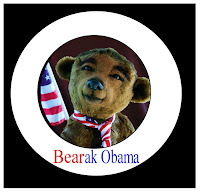 These filings include stuffed toys 'Bearak Obama', and 'ObamaLlama', a candy bar 'Obama', 'Obama vodka', 'Obamanator' for beer, 'Obamanation' for clothing, 'Obamaniac' for shoes, 'Broccoli Obama' for fresh and frozen vegetables, 'Obamajamas' for sleepwear, 'Ob-La-Di Ob-La-Da O-ba-ma' for assorted t-shirts and novelties, and even an application for 'Obamaland', not an amusement park but to market educational publications and guides and last but not least Obama’s motto 'Yes we can' in Ben & Jerry's ice 'Yes Pecan'. In Europe, a search on the trademark database of the Office for Harmonisation in the internal market (OHIM) resulted in seven pending applications, for instance 'Nobamanus' for hand-care creams and 'Nobamask' for materials for dressings. At the Benelux Office for Intellectual Property (BOIP), two applications have been filed, ‘Obama’ for magazines and musicals and ‘Obama’ for seeds and flowers, maybe a tulip’s name for the Obama family? constitute a government's flag or coat of arms, marks that consist of a name, portrait or signature identifying a particular living person without their consent, or marks that consist of a name, portrait, or signature of a U.S. President during the life of the President's widow, without her/his consent. Registration of the present application is also refused under Section 2(c) of the Trademark Act, for the record does not include the written consent of Barack Obama and Osama Bin Laden, the names of the living individuals identified in the proposed mark. Section 2(c) of the Trademark Act, 15 U.S.C. Section 1052(c), bars the registration of a mark that consists of or comprises (whether consisting solely of, or having incorporated in the mark) a name, portrait or signature which identifies a particular living individual, except by the written consent of such individual. A name need not be the person’s full name in order to identify a particular individual. A few of the Obama trademarks have already been refused by the USPTO. So the question is which of the Obama pending applications will actually stay ‘alive’. For more publications regarding US trademarks, see the Peace Palace catalogue on the keyword combination USA and Trademarks. See the Barack Obama and Joe Biden's planto learn more about the US policy on intellectual property. “People suffer from Obamania” sounds pretty bad though. Very clear and nicely written article. You can also think about our still growing madness during the European footballgames for example. We are not so crazy as the American people, I can’t believe that people in the Netherlands will buy a toy or clothes with the picture of a running candidate for elections. Maybe you can blog about the working out of the US guide-lines in future, after the mania.